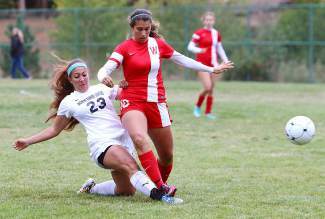 North Tahoe's Jamie Lanza breaks up a possession by Whittell's Gabriela Trachsel on Wednesday. The Lakers scored two second-half goals to earn a 2-1 win. TAHOE CITY — It was apparent throughout Wednesday’s league game between the Whitell and North Tahoe girls soccer teams that neither side was going to pull away. After the visiting Warriors snapped a scoreless tie in the 38th minute, the Lakers answered with two unanswered goals in the second half to eke out a 2-1 win. The win adjusted the Lakers’ record to 2-0-1 in the Northern Division III; Whittell fell to 2-1. While the Warriors look capable of defending their state championship title, they certainly miss the loss of their talented senior class from last season, as well as 2014 league MVP Kenya Maltase, who transferred to South Tahoe for her senior year. “We definitely lost some key players from last year. Depth is where we’re lacking,” said first-year Whittell coach Stephanie Shamo, who shares coaching duties with David Caputo and Nick Arbelaez. Whittell freshman Anna White put the Warriors on the board with a goal assisted by junior Alison Copsy with two minutes to spare in the first half. North Tahoe battled to knot the score early in the second frame, as standout senior forward Bryn Anderson found the net on an assist from freshman AJ Hurt. Hurt gave the Lakers the lead in the 61st minute, assisted by Jillian Ferre, and North Tahoe held on for the remaining 20 minutes for the win. Sophomore goalie Rosalinda Juarez helped preserve the lead with a fine second half, highlighted by a charging save on a breakaway run by Whittell junior Angelina Stetler. “I think (the win) definitely gives us a big boost of confidence and lets the girls know they can compete against good teams,” Bales said. The Lakers entered the game on the heels of a 4-4 tie at Pershing County last Friday and a 9-0 win over Battle Mountain on Saturday. Against the Mustangs, Anderson scored three goals to lead the way, while Piper Joubert, Maddie Cleeland and Hurt added a goal apiece. Two different Lakers scored hat tricks with three goals against the Longhorns — Jamie Lanza and Hurt. Cleeland, Lindsey Twomey and Valencia Covell each had one goal. Hurt also dished out three assists. The Lakers will hit the road for league games at White Pine and West Wendover this Friday and Saturday.